The error code AP has come up on my Kyocera KM-1530 printer and it will not copy. It appears empty of toner, is this what it's saying? Low toner on Kyocera KM-1530 printer? The Kyocera KM-1530 printer is reliable, fast and capable of excellent prints. Some day in the future your Kyocera KM-1530 will gobble up all of your printer toner, and when it finally happens you'll discover that new Kyocera KM-1530 toner tends to be costly. You do not need to fret about paying the high fees you'll get on the main street because here at Cartridge Save you can purchase all the Kyocera KM 1530 cartridges you'll want at very competitive prices. Save cash by purchasing with Cartridge Save! There's no reason why you should fork out so much on the KM-1530 original cartridge or KM-1530 compatible toner on the main street when it's simple to save a pile of money shopping with Cartridge Save. Get full satisfaction when you buy your KM1530 toner cartridges from us as they all are protected by a no quibbles money back guarantee. Bear in mind the fact that every purchase also comes with free delivery, usually delivered to you the next business day! Offices in need of a printer and copier should opt for the multifunctional Kyocera KM-1530. This dual laser printer and copier can help save space. 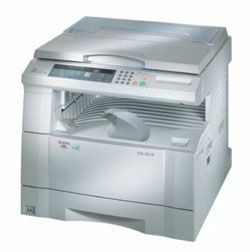 The Kyocera KM-1530 mono laser printer uses an 8 MB memory expandable to 136 MB plus it offers a 600 x 600 dpi resolution. The Kyocera KM-1530 printer can handle different types of media as large as an A3. Print and copy speeds are rather slow. The main unit of the Kyocera KM-1530 comes in a cube-like shape with base paper trays and a scanner. For connectivity, a parallel port is available. The Kyocera KM-1530 printer features an organised control panel with function buttons and a numeric keypad. This printer and copier has a speed of 18 ppm. The KM1530 mono printer can handle 300 sheets at a time but with optional trays can be upgraded to 1,000. Users can expect good quality output from the Kyocera KM-1530 monochrome laser printer, it delivers crisp text documents and solid greyscale images and graphics. This reliable unit is user-friendly; there will be no trouble from setup to operation. The KM1530 has low running costs and requires little maintenance, thanks mainly to high-yield consumables. Furthermore, users can install a compatible Kyocera KM1530 laser toner for cheaper printing costs. The Kyocera KM-1530 does not come with a standard automatic document feeder and Ethernet; a duplexer is not offered, even as an option. This unit can use a boost on its slow performance. Even with optional paper trays, paper handling is still quite low. The Kyocera KM 1530 may not be compatible with newer operating systems, it does not have a USB port.